The latter two hydration reactions have a different issue. Namely, it’s impossible to mentally envision their products without showing any work. What am I suggesting? Mechanism. Only by learning to power through mechanisms quickly and with confidence will you be able to determine and compare alkene hydration products. The following methods are how I teach my students to systematize the process. Since this mechanism is carbocation-based we expect our H2O nucleophile to attack the planar sp2 carbocation from the top and bottom face with equal probability, which results in equal syn + anti addition. But wait! We already forgot something. The mechanism is carbocation-based . . . meaning rearrangements like hydride and alkyl shifts are possible, and things can get messy. I put the original carbocation in a place Markovnikov would respect. Just note that your professor may want you to show anti-Mark. products to technically satisfy the all products condition. Moving on . . . I performed a hydride shift to get to a benzylic carbocation–the best carbocation we got! 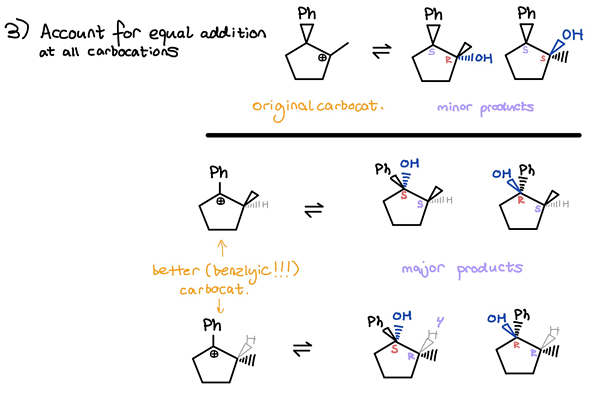 As you can see, we technically get two new carbocations since the hydride can shift to either face of the original carbocation. To finish up . . .
There’s no way we could’ve done that in our heads! Ah . . . Three-membered intermediates. Tackling these is best shown with an example. Following Hg(OAc)2 dissociation, the nucleophilic pi-bond of the below alkene can attack the resultant Hg(OAc)+ from either the top or bottom face. I always show attack from the top face to stay consistent when solving different problems, and I recommend you do the same. Check it out . . . I labeled the above substituents in orange and blue to emphasize that, during ring creation, you must preserve the original stereochemistry. I rotated the middle molecule to better show this stereochem. Next, you should recognize that three-membered ring opening is an anti process. 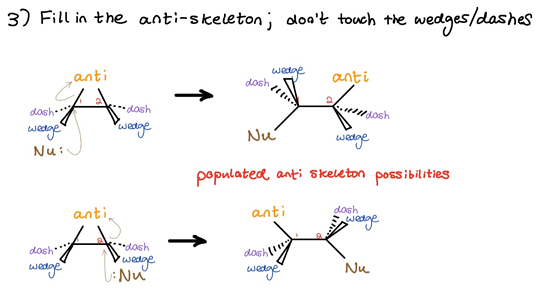 We now draw an “anti-skeleton” based on where the nucleophile is going–in this case, Markovnikov placement. 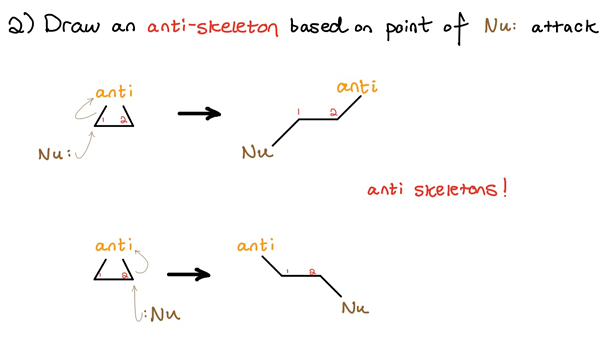 Again, which anti-skeleton you choose—top or bottom—depends on where the nucleophile attacks. We next fill in and populate the anti-skeleton. Keep substituents previously on wedges on wedges, and keep substituents previously on dashes on dashes. In other words, don’t touch anything! As you can see, we once again took note of what substituents are on what side of the double-bond. 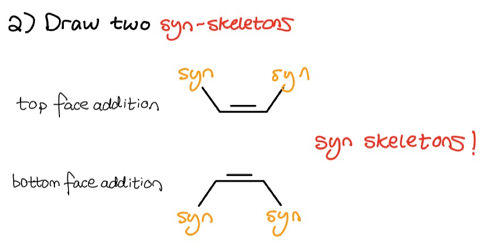 Since hydroboration-oxidation follows a syn-mechanism, we must now draw two syn-skeletons to account for both top and bottom face addition. Finally, we populate both skeletons and keep in mind that the hydroxyl goes to the less substituted (anti-Mark.) side. Wrap up by filling in the substituents. Don’t touch the wedges or dashes. Alright–you can now systematically power through the three main alkene hydration mechanisms. My leftover advice is to get comfortable determining the resultant stereochemistry. On exams professors love to provide you potential products and ask if they are, in fact, possible products. The only way to safely solve this problem with confidence is to compare the configurations (R/S) of your own products with the configurations of those given by the professor. Have fun! 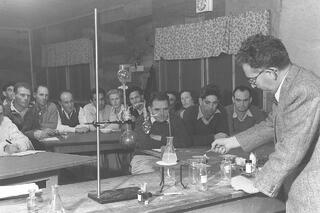 Are you interested in getting set up with an organic chemistry tutor in Boston or New York? Craving more on the subject?